Meet Richard Overton. He’s America’s longest living World War II veteran, and he also happens to be a badass. 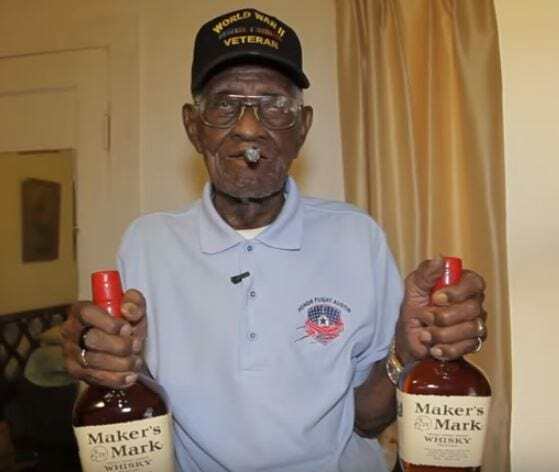 Overton, from Austin, Texas, fought in the 1887th Engineer Aviation Battalion in World War II, and served as a corporal in Hawaii, Guam and Iwo Jima. He’s 110 – and he credits his long life to smoking cigars and drinking whisky. In a 2015 documentary for Guns.com, Overton revealed being able to defend himself with firearms is the secret to living long. And according to NBC News, the 110-year-old’s tips for longevity also include a steady diet of fried catfish and butter pecan ice cream. Born in May 1906, Overton joined his all-black military unit in 1942, when Franklin D. Roosevelt was president, and became a skilled sharpshooter. Since the war, he’s outlived two wives, received plenty of honours and even had breakfast with President Obama for his 107th birthday. I feel good. A little old, but I’m getting around like everybody else. I don’t think about (dying). You can’t do anything about that. It’s going to come, whether you want it or not. I just think about living. As for crediting alcohol to a long life, Overton explains that putting whisky in his coffee every morning ‘makes your muscles get warm’. Well, it seems to be working.